DON’T BE A “BORED AGAIN” CHRISTIAN! Steve Martz recently wrote a book he entitled 77 Talks To Bored-Again Teens. Explaining the rationale for his book, Martz says, “With teenage attention spans decreasing as fast as new channels appear on satellite TV, it’s not just a case of presenting the gospel as it stands and hoping they ‘get it.’ In this post-modern age you have to hit them in bite-sized chunks to make an impact and make tentative steps into their world.” There is no doubt that our world is changing, and most of us change with it to a greater degree than we realize. This blog post, your congregation’s PowerPoint, your dish, your DSL, your i-stuff, and a thousand other gadgets are shrines paying homage to such change. These things may indeed challenge the perseverance of our attention span. Yet, with all due respect to Martz’ attempt at accommodation, I think his premise misses the point. Without intending to, Martz is trying to improve on God’s means of communicating His message. If it is not still “the foolishness of preaching” whereby God seeks to reach and save mankind, what can man invent to better it (cf. 1 Cor. 1:21)? However, I am certain that there are “bored again” Christians of all ages scattered here and there. I agree that there should not be any, but let me suggest some other ideas for breaking out of these doctrinal doldrums. Break out of the entertainment mindset. Each of us should remind ourselves every day, “It’s not about me.” Humor-filled, emotionally-tugging, and feel-good lessons may touch a more superficial part of us, but we should remember that listening to a sermon or singing a spiritual song is not the same as watching a good (?) movie or listening to our favorite musical performer. Read the sermons of Peter, Stephen, and Paul. Vegetable-Soup For The Israelite Soul or Your Best Roman Life Now was not the foundation for their lessons. Andrew, Bartholomew, and Philip were not a traveling drama troupe or praise team. The Greeks and Romans had actors and actresses, stage and plays. The early church was not interesting in tickling a funny bone; they wanted to save the soul. Renew your relationship with God. The Christian life can become more exhilarating and exciting the longer you live it. As your inward person is renewed daily (2 Cor. 4:16-18), you will find God, His Word, His promises, His love, and heaven more real to you. Even as your body breaks down, people disappoint you, and others desert Him, you can find Him dearer and closer to you with each passing day. Even as living the Christian life brings tears, sacrifices, and persecution, it will not seem boring to you! Paul is pretty discouraged at times in 2 Timothy 4, but he never once sounds bored. 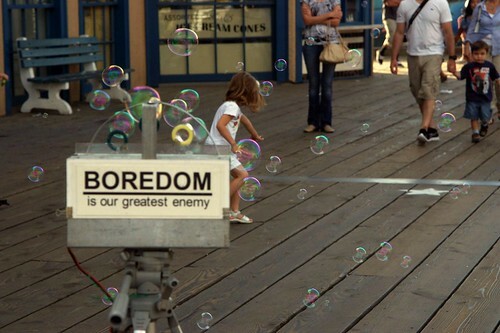 My grandpa would say that boredom means you have too much time on your hands anyway! Find somebody to serve. Boredom reflects the luxury of thinking about and tending to self. Stephanas and his house devoted themselves to service. The Bible does not say, but I cannot imagine them being bored (cf. 1 Cor. 16:16). Christians have been liberated to serve (Gal. 5:13). Through serving one another and in all serving the Lord, we will find great satisfaction and reward (cf. Eph. 6:6-7). I have seen few true servants that were unhappy, much less bored. This is a sure remedy for the “bored again” Christian. Someone once asked a preacher, “What is worldliness?” A teenager in the class answered, “It’s letting the world set the standards.” That may be the best definition I have ever heard. Let us not let the world set the standard for spirituality, excitement, or enjoyment. Those trying to medicate themselves with entertainment are heart-sick folks! True excitement and joy comes in overcoming this world (cf. 1 John 5:4). Don’t be a “bored again” Christian! Previous postWhat If There WAS An Ebola Outbreak In Your Town? Fantastic thoughts, Neal! You are addressing a very relevant concern of our day. And as well, your solutions are right on! Following Christ means high adventure. When people are bored, they just don’t understand the Bible message. Thanks so much! Jesus “hit” the blind man in John 9 in “bite size chunks”, or allowed him to be. This is not something new, really, is it.? I appreciate so much what you’ve said here about entertainment and the early apostles/preachers. Let’s get down to where the rubber meets the road. About Stephanas – thank you for that reminder. What an example, and I needed that. Excellent article.